Grappleline invites entries for the 2015 WHAT IF Challenge to solve real problems in their communities. The‘What If’ challenge aims to stimulate the minds of everyone to imagine and share ideas that could solve real problems and add value to the world. 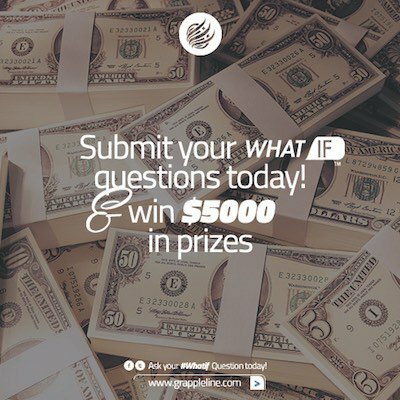 Grappleline believes that the most important discoveries come from the simplest questions – and so they’re inviting everyone to join them in asking questions that really matter. By submitting your ‘WHAT IF’ question, you will automatically enter for a chance to win prizes valued up to $11,000. The Participant’s “#WHATIF” sentence must express a dream, a problem identified in the society, or an innovative project that adds value. The proposal submitted by the Participant must be achievable (and thus, cannot be based on non-existent technologies). The proposal’s social media response (Likes/Shares/Comments) (20%). Participation is very simple: Think of how you’d like to change the world and write it down in the form of a short question starting with the words “WHAT IF”. Within 24 hours, you’d be E-mailed a graphic design of your #WhatIf entry. Upload on your Facebook, Twitter or Instagram Profile. Remember to include the hashtag #WhatIf. To read the Terms and Conditions, Download the full contest guide here.